After a 9 month self imposed hiatus on health grounds, I returned to the fell s this weekend. Steve Robinson and I travelled over to the beautiful Calder Valley for the Midgley Moor fell race. 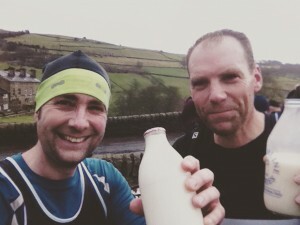 5 miles with two good climbs, approximately 1,250 feet, the going was good, boggy, windy, and wet, with a pint of milk from the farmer at the finish. The perfect return really! I took things easy, being a fan of completing races rather than being carted off the moor in an ambulance. Lots of route choice, bouncing over heather to reduce the level of leg scratching, and a bit of bog hopping. Beautiful views when I looked around too. Phil Marsden (Horwich) won in 43.14. Claire Duffield (Todmorden) was first woman in 55.43, 30th overall. I finished 18th in 52.48, Steve not far behind in 32nd in 55.53. Thanks to all the marshals for standing out in tricky conditions, and to the Woodheads for excellent photographs here: Set 1 and Set 2. Nice to see you back racing Shane, love this pic, somehow it seems to sum up fell running nicely. Ditto Tom Lynch! Running as good as ever Shane..beats a treadmill …. well done both and where’s your milk moustaches? Welcome back to racing Shane and you selected as well a short but tough fell race like the Midgley Moor on a hard and wet day , your 52.48 is a powerful come back with an excellent performance , also Steve R. ran well with a good 55.33 .